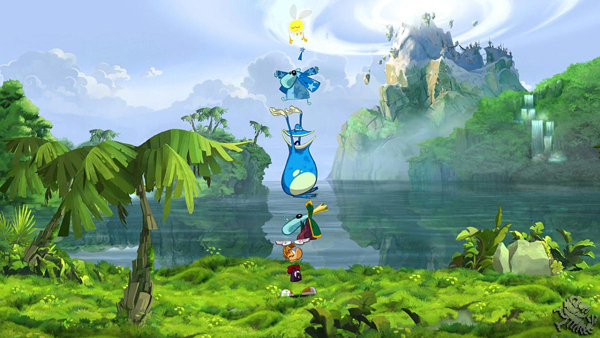 Over recent years, the Rayman brand has been used to sell casual party games with the Rabbids spin-off games. But now Rayman is back and he has brought some friends. 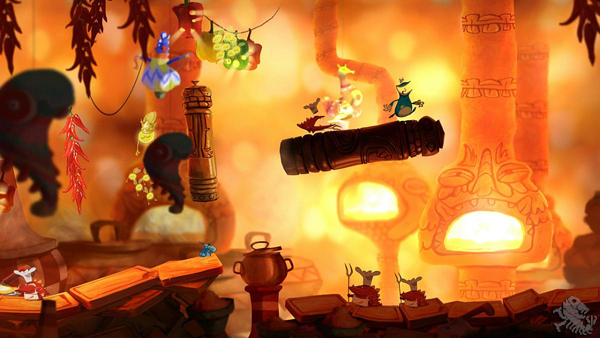 Rayman: Origins takes places before any of the previous games and explains how Rayman and his friend Globox got their start. 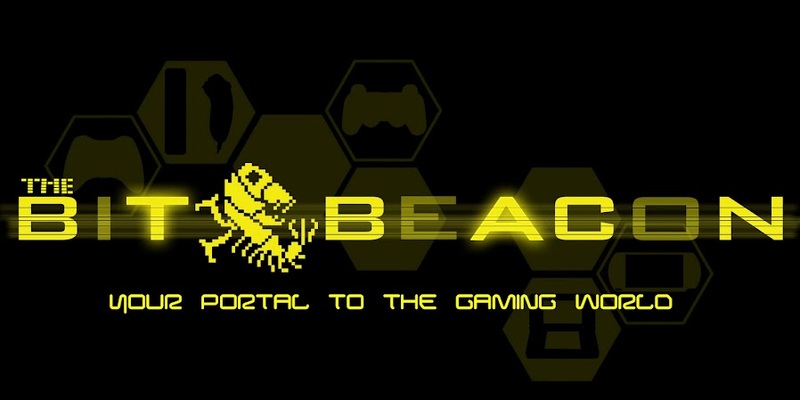 This side scrolling platforming adventure features up to four player drop-in / drop-out co-op gameplay. 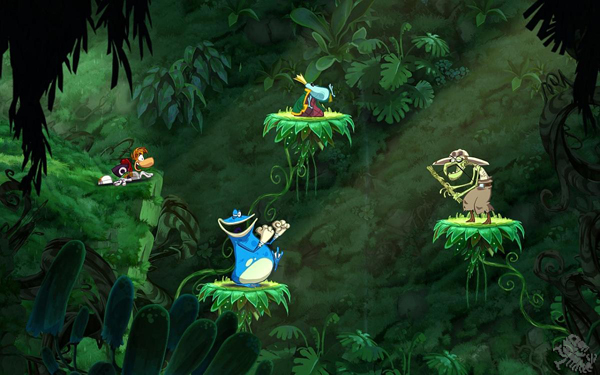 Rayman, Globox, and two teensies will be playable in the game. While I was at PAX Prime this year I stopped by the Rayman booth to check the game out. One of the frag dolls at the booth set me up with another player who was in the middle of a level but it was no problem to just pick up the controller and join in instantly. The controls are simple but intuitive. You can jump, kick, punch and hover briefly with just the face buttons. One control stick is used for walking, running, ducking and sliding. In seconds I was in the fray with my partner. The first level we tackled used air flow as its gimmick. Most of the level was spent flying around and taking advantage of the characters hovering techniques. Special tokens are hidden around and surrounded by enemies; if you can manage to hold onto these tokens for a few seconds they will add to your score for the level. After the air level we went to a new zone themed around ice. This area had us slipping and sliding up and down ramps into the air over sinking icebergs in a sea of Rayman-eating piranhas. It was a bit hectic to say the least. This was the type of area where you really had to take your time and be methodical about all of your moves. But then Ubisoft threw a wrench in that idea and forced us to chase down a monster forcing us to speed up our progress. This is where things got silly, both my partner and myself were busting up laughing. The game is truly hilarious, to the point where you will have a huge grin on your face. It’s not just the hilarity that will have you smiling. The areas and level design are brilliant and immensely imaginative, it is almost jaw dropping. 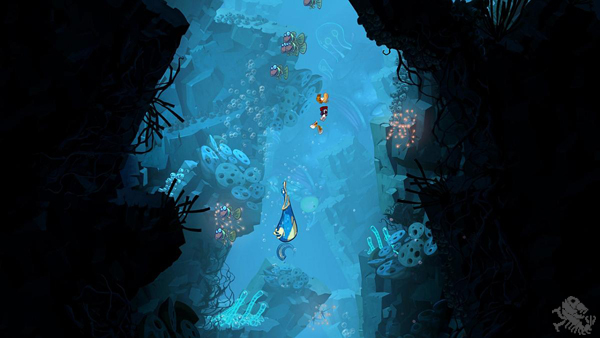 Not to mention the art style the game uses gives you the sense of playing in a crisp hand drawn cartoon. When you combine all of this with the fact that the game runs in full HD at 60 frames per second (on PS3 and Xbox 360) you are looking at one of the most beautiful games you will ever see. Unfortunately, I didn’t get to hear much of the games music or sound because I had to take my headset off to communicate with my partner. This brings up another point, that communication is very big in Rayman: Origins when playing co-op. There are many out of reach items and platforms that you simply can’t reach without a friend giving you a boost. More than once while playing one of us would notice a hidden path or door to another area containing all sort of extra goodies. While this game might be fun to play by yourself, I can assure you it will be a lot more fun with friends or even strangers! After wrapping up the ice zone we called it a day and high-fived to great success. Rayman: Origins was quite the blast to play and I look forward to getting some friends together and spending an evening with the game. Rayman: Origins will be available on Xbox 360, PS3 and Wii on 11/15/11; on Nintendo 3DS before the end of the year; and PlayStation Vita sometime next year.